Four weeks in Argentina as a field assistant on a GPS campaign is enough to know when you are in love with a cuisine. The Argentines know how to cook (they’re all Italians, for crying out loud) and dance and drink and smoke and drive like maniacs and look beautiful. I have some favorite foods from what we sampled in restaurants, from the grocery stores, and in the homes of so many kind hosts. The best part was the asados – argentine barbecues that literally had 7-8 courses of MEAT. First we start with morcillas (blood sausages) and chinchulines (organ meat sausages) and then various cuts of beef like lomo and bife de chorizo at the end. You work yourself up to the best cuts, but of course by then I was drunk from all of the flowing red wine and probably had colon cancer to boot. I also loved the morning dose of dulce de leche on tortas warmed over the parilla in camp in the morning. And then there were the empanadas. I know many countries have their versions of empanadas and let me just state right here that I don’t care for the Chilean rendition of an empanada, no matter how nice their people are. Becky and I were driving outside of Mendoza with the picturesque, snowy Andes as our backdrop when we finally came upon a small town. Nothing was open. It was siesta and we were starving with only 30 minutes to stop for food before we had to head to the next site to set up and make camp. Becky walked into a restaurant where two women were quietly talking over the remains of their lunch. She asked if the owner was around and one of them said, “Oh, he’s asleep – I’ll go wake him for you.” The proprieter came out drowsy-eyed and asked what Becky would like. He deep fried some fresh empanadas and tossed a dozen into a brown paper bag. Becky gave him three. When she hopped into the truck and tossed me the bag, it was burning hot and oily. Those empanadas were pure heaven to eat. Tiny, golden, hot, and delicious. It wasn’t a one time thing either. Everywhere I went in Argentina, the empanadas were sheer pleasure. I found this recipe in Saveur years ago and held on to the article because it’s all about Argentina. I’ve posted it before for Sheri, but I never tried it myself until today. I wasn’t planning on baking anything, except that when I looked around at all of the sweet things in the house, I had no appetite. I like savory and for some reason I thought of empanadas. I had what I needed. The recipe is pretty straightforward and simple. I omitted raisins in the filling because I never really liked them and most of the best empanadas I had didn’t have them either (although it is indeed, authentic). I also omitted the bell pepper because I didn’t have one. 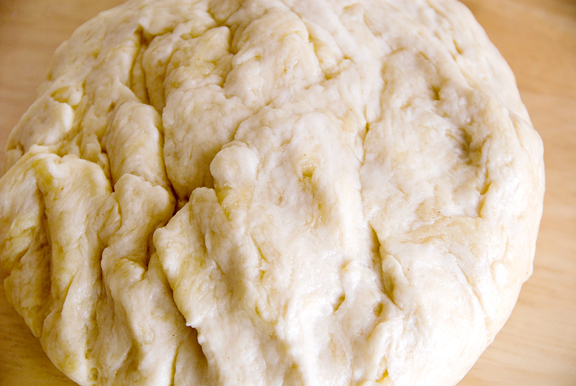 The dough is super easy to make, but requires a couple of hours for refrigeration. You definitely won’t want to skip that step or else you’ll have a gooey mess and, if you’re anything like me, a lot of swearing. The prep for the filling requires a little time to boil the eggs and potato. Just do your mise en place and it will be a lot less hectic. I subbed beef bouillon for the chicken bouillon and instead of diced beef shoulder I used organic ground beef – just what was handy at the time. The recipe said to divvy up the dough into about 12 golf ball sized rounds. I had 26 rounds and still about 20% leftover filling. For the dough: heat water and lard (butter) in a medium saucepan over medium heat until lard (butter) has melted. Mix flour and salt in a large mixing bowl and make a well in the center and sprinkle a pinch of paprika in the well. Pour a little of the warm liquid in and stir with fingertips to make a wet paste. Pour in remaining liquid and work the flour into the dough with your hand until you get a wet, oily dough. 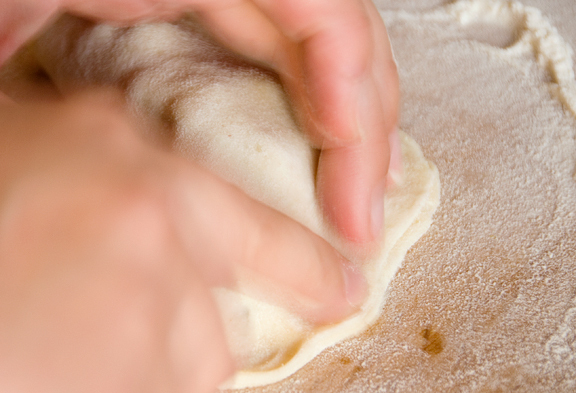 Wrap the dough in plastic and refrigerate for at least 2 hours. For the filling: Heat oil in a large skillet over medium heat and cook the onions, bell peppers (omitted), bouillon, paprika, red pepper flakes, white pepper, and cumin, and cook until onions are soft. Add beef, season to taste with salt, and cook until beef is browned. 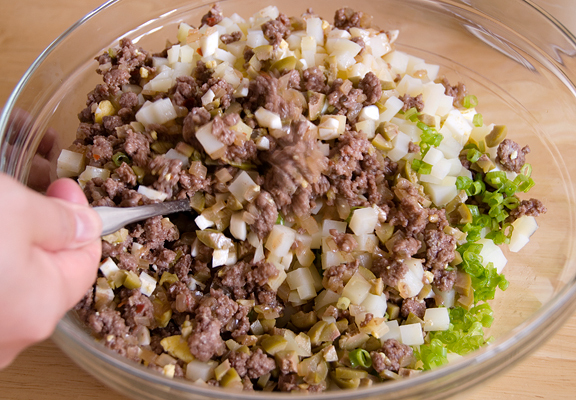 Place filling in a large bowl and when cooled, add potatoes, raisins (omitted), olives, scallions, and egg. Mix. Preheat oven to 400F. Tear off pieces of dough to roll about 12 (24) golf-sized balls. 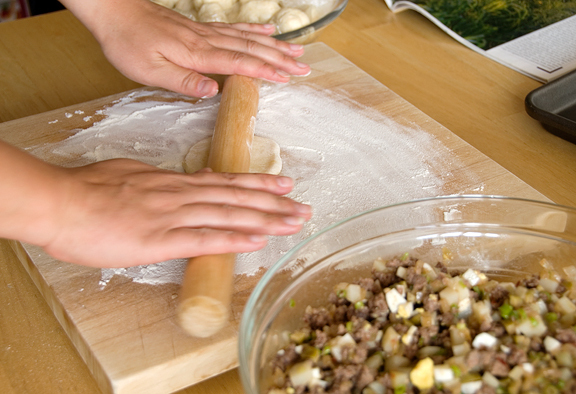 Using a rolling pin, roll out dough balls on lightly floured surface into 5-inch circles. Place 3 tbsp of filling in the center of each dough circle. Fold over and press edges firmly to seal. Rope pinch the edges tightly. Place empanadas on cookie sheet and bake until golden brown, 15-20 minutes. Makes one or two dozen (depending on the size you make). Hi there! First things first: your site is amasing! I love the pictures and I love the food. It just makes me want to go to my kitchen and try your recipes. Congratulations! Silvia – thank you for your sweet comment. So nice to hear from someone in Argentina! I really enjoyed my time there even though it was a “work” trip, we managed to have a lot of fun. I realize I barely saw the country (only BA briefly, Mendoza, and San Juan), so this means I need to return to continue exploring the countryside, meeting wonderful people, and eating more of that awesome cuisine! I still remember having my first taste of membrillo – mmmmm! I made the empanadas for the 2nd time using your recipe – it was with a bunch of middle-schoolers that I’m teaching a cooking elective to. 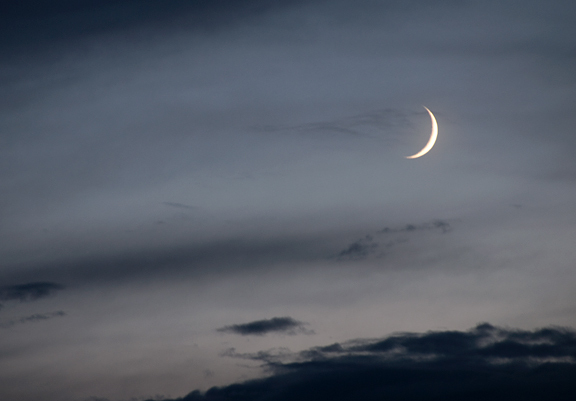 I wish I had taken some pictures – they turned out really well. We added a step by brushing the empanadas with egg yolk before baking them. The kids said they tasted amazing – best mini meat pie ever. You gotta love ’em. HB – hey girlfriend! That is so totally cute that you made these with middle-schoolers! What an awesome idea :) You rock!!! Cindy – you’re welcome. I hope they worked out for you! Hi Jen! My first encounter with your blog. It’s amazing, I think from now on I’m hooked! With regards to forming the dough and making the rope pinch, I wish you were more specific and did it step-by-step. I’m kinda new to this and I don’t know what you meant when you said to “rope-pinch.” I love, love your photos and recipes. Mel – thanks for your nice words :) Sorry I wasn’t more specific. The whole thing was a tad ad hoc and well – I’m not made of spare time ;) I think any sort of pinch on the dough so the filling doesn’t ooze out is good enough. However you want to gussy it up is up to you! I am going to brave trying to work with dough again because of this recipe. 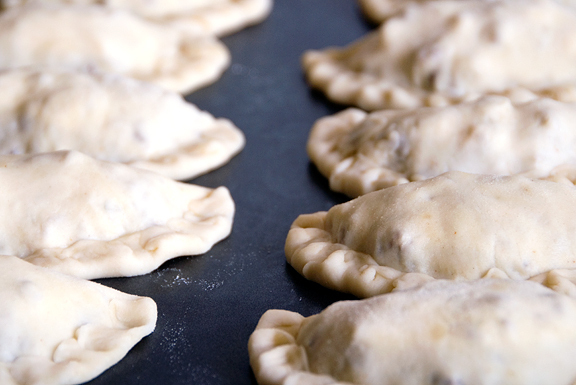 It is similar to the Polish pierogi, in many ways, though with frying rather than boiling and pan searing. Though i guess I’ll bake mine, too. Frying seems messy. Yours look so perfect in the photo that I feel a little intimidated, but I’ll give it a try! Oh, and you should try rendered leaf lard (pig lard). It is a monounsaturated fat like olive oil, actually, but more heat stable, and it won’t burn the way butter does. It is perfectly healthy as well. First wanted to tell you how much I love your site. You are amazing – pictures, recipes, food – all so great! I spent 6 months in Argentina last year so was interested in this post. I found that most people eat baked (al horno) empanadas instead of fried…and although beef is traditional, there is some pretty good variety in terms of fillings. The “caprese” is everywhere in Buenos Aires – kind of like a mini-calzone with basil, cheese, and tomato. I think my favorites were acelga y ricotta (chard and ricotta) and higo y nueces (figs and nuts with cheese). These were very urban though. In the outer provinces choices are much more limited, and each province has its own distinctive kind of empanada. Oh, and I’ve heard that the best empanadas are the kind that squirt hot oil and meat juice down your chin when you bite into them….yum? You are so right about the spicy thing – my (American) friend and I happened upon a bottle of Tabasco sauce about 5 months into our stay and doused everything with it because we were so spice-deprived! Mia – oh wow, now I’m craving empanadas! :) We didn’t get to sample nearly as many varieties as you did, but we were short on time in the towns since we were doing field work. Thanks for sharing!! i am so glad to found your website…..i am so impressed with you……..finally i found a person who like to show a lot of pictures for everything………. By the way, thanks a lot because thanks to you i am going to make my rag quilt…..the explination with that detail and pictures step by step is hard to find…. ( and i am very visual person, i like see the picture and figured out by myself what they mean But no always get it right)……also i am going to make the empanada argentina……..and i will check all the recipes. Nice post. The only curious note is the fork in the final photos. 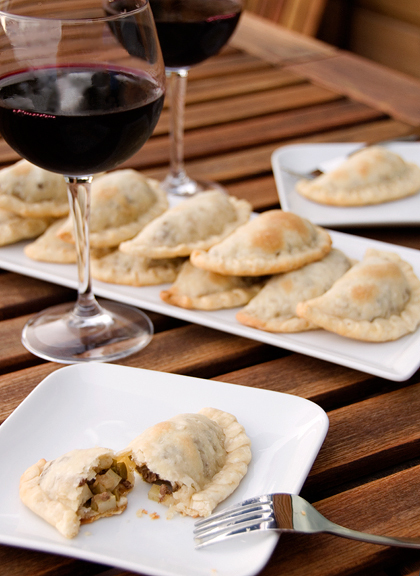 Empanadas are finger food in Argentina! This is a nice post. Just a quick question. How many empanadas does this recipe yield? Luke – it’s been a while since I made these, but I seem to recall at least 2 dozen (if you make them about the size of your palm). Found this recipe through a google search, tried it out on my Argentine husband and his cousin, and they loved them. I made over 30 and they didn’t last two days. I must admit, I was surprised as I kept looking at your site that you weren’t some old Argentine grandma but instead are a young Chinese American woman. I am too so the recipe coming from you seemed just right. Thank you for this great site! Janet – thanks! I got the recipe from Saveur magazine. I spent a month in Argentina ten years ago and fell in love with the food there. LOVE IT :) Good on ya! I’m Argentinian and hey this empanadas look FANTASTIC!! in fact all the recipes look fantastic, Go Jen you are good!! Cecilia – thank you :) What I wouldn’t give for a piping hot empanada in Mendoza right now!! Samira – glad that you enjoy the blog and the empanadas :) thanks! Hi Jen your blog is very good, I love cooking, I´m french and I lived in Argentina many years. I live in Mendoza and in La Rioja, and the recipe of the empanadas are from La Rioja, they used the potatos, the Mendocina no. The ones from mendoza are baking and the others are frying in lard. Both are very good. It was very nice to find the empanadas of my childhood. Carole – you’re very welcome. I hope one day I will return to Argentina for pleasure rather than work. It was delightful. all at the age of 16! Mattw – awesome. I hope you find them up to snuff! I just got back from Argentina and can’t wait to go back. I am having a dinner party for 12 this Saturday for New Year–all Argentine! Your recipe verifies one that I found in a tourist cookbook. I like that you use butter. I had a spinach or chard and cheese in Calafate and it was great. The fig/nut and cheese sounds good too. Thank you. Happy New Year. Nina – you’re welcome, and I hope your party was a hit! OMG! Thank you for the recipe for Argentine empanadas. My husband and I have made 10 trips to Bs As Argentina in the last 4 years. We love the people, the food, the wine (Malbec) and the city! Now, I am homesick for Argentina. There is no place like Bs As Argentina. And we don’t speak Spanish. My husband would move there in a heart beat. Your website and pictures are amazing. DON’T CRY FOR ME ARGENTINA!!!!!!!!!!!!! Nancy – thanks :) Argentina is indeed a wonderful place for foodies. I love this recipe! I just googled this EXact recipe – I’d lost my copy [put it somewhere safe I think :)]. Glad you have it here! 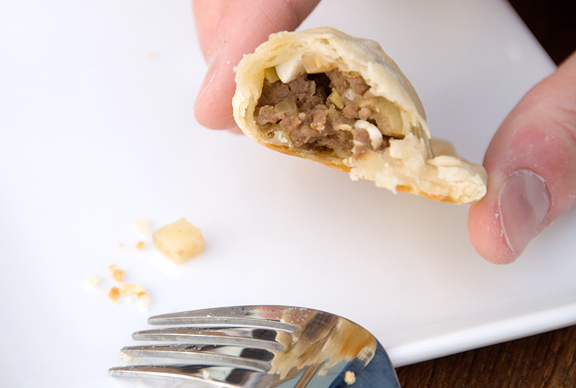 I agree – Argentine empanadas beat their Chilean counterpart hands-down :) thanks! Anne – terrific! It’s such a kickass recipe! I was just in Florida, tasting some Argentinian empanadas at a local hot spot, a native of Venezuela, we make them out of corn flour, I much prefer them like yours, regular flour, flaky and not fried…a variety of fillings were available at the place, I chose spinach and feta cheese my fiance chorizo-provolone & tomates, your filling sounds spectacular, like your photos!!! I will make them as you suggest, quite frankly, I adore your blog!!! Mucha suerte Jen!!!!!! Ruth – Awesome :) Thank you and I hope they are to your liking. WOW…I’m go going to have to make this. Yay for your DB Challenge bringing my attention to it. Hi Jen, I just love your site, I always come around and have a look to see what is new. You caught my attention some time ago when you had pic’s from you black lab. But I also love nature, photography, cooking and obviously, dogs. I am from Argentina too and just loved the idea of you two around Mendoza with a paper bag full of empanadas. I prefer them in the oven, and my favourite ones are chicken, mashrooms and cheese or capresse. I see someone asked about the choclo ones. Those are very easy to do: you get some corn, boil it, take the grains off (or you can buy a can with the grains), you mix it with some onions which you should previously sautee a bit, and then you can mix it in with some bechamel sauce. 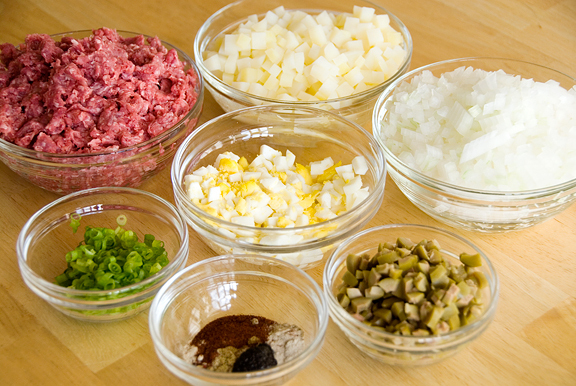 All of that goes into the empanada. It is great to put some nutmeg. There are also sweet empanadas, but they haven’t reached success yet… there are some with dulce de leche, and some with membrillo. You should try the “pastelitos de membrillo” if you liked the taste of that. It is done with the same dough of empanadas… if you want I can pass that one to you. I went to Argentina 6 months ago and have been craving empanadas since. I can’t wait to try out this recipe! and then she puts it in the oven and lets the top get brown instead of deep frying it. Kimberly – are you referring to the dough in THIS post? I am completely confused. Maybe if you could explain clearly what it is you want, I can try to help you. i love your recipe i tried it and its yummy, thanks for sharing. just returned from a trip to south america. spent 3 days in Buenos Aires aqnd loved it….buen dia….loved the empanadas and just copied the above recipe….will try after thanksgiving. I’m rather new at cooking and I’m little confused about what it means to “make a well” in the center. Can you please explain that step??? Thanks! Anj – dig a little well or hole in the center of the flour with your hand (make a crater). Melinda – I have baked them and then frozen them successfully. Just take them out of the freezer and bake to reheat. I gave these a try today and they turned out great! Thanks for the recipes! I love your site! thanks for posting! you have beautiful photos on this site. i got addicted to empanadas when i went to buenos aires a few years ago. now if you could just post a recipe for medialunas i’d be all set :). I must say I am humored with your introduction to this recipe. When I was in college we did a group trip to Argentina and Chile. I became an empanada fiend, I ate them every chance. And, like you, I distinctly remember finding that Argentinian empanadas were far superior to Chilean! I’m amazed you made the same discovery! Hi. I am an avid baker and cook as well and made my first batch as well. The fillings are endless when you have dough that tastes this good. Thanks so much for the step-by-step guide. I was wondering though if you have tried to make the empanadas (filled and read) and THEN froze them unbaked? I have a big party coming up and I am thinking these would make excellent appetizers if done a bit smaller. IF I can freeze them and then bake them before my guests arrive would be great. Any ideas on this? Lisa – funny you should ask! I’m making a batch now for a party and it would be so nice to freeze them ahead then bake as needed. I haven’t tried it so I can’t tell you what works or doesn’t. I have baked them through before and then put them in the refrigerator and reheated them to crisp up the dough in the oven. Let me know if your method works out! Hi, I am a homeschool Mom. I just wanted to let you know that we found your website recently while doing a school project. Each November the students in our group give presentations on a country they have chosen and are required to cook a dish from that country. My 14 year old son, Noah, chose Argentina and found your website while doing his research. Your empanada recipe was a hit with the students and our family. It will now become a regular meal in our home. Thanks for sharing. I made these yesterday and they are amazing! This will certainly be my new go to recipe for empanadas :) thanks for posting! Hi there I first came to your website after googling lard from heaven recipe. I was actually looking for a recipe that caught my attention. They were talking about argentinian recipes in a public radio that I listen to in Chicago Il. If I recall correctly the recipe is a dessert which sound delicious is made of egg yolk and sugar. The sad thing was I didn’t get the right name for the recipe. tozino del cielo I think is called. Anyway if you can help me find it that would be awesome! I decided to ask you this because of the comments that I read which lead me thinking that you must specialize in argentinian cuisine. Well either way it sounds like this is an awesome empanadas recipe which I will definately try making. Thank you Noemi! Noemi – Sorry, I haven’t heard of that (nor had it) before. In general, you can search the site (see search field at the top right) or look through the recipes (top menu, click on recipes). Okay, I’ve lurked around your blog for years now. Always love your pictures, words, recipes…everything you share is wonderful, honest, and real. I get excited every time you post! Made MANY of your recipes with fabulous results and happy bellies. But seriously, these empanadas are AMAZING! Like, life altering. Granted, I’m 9 months pregnant so that MIGHT have something to do with it! Ridding in a car with an Argentinean is worst that ridding a rollycoster! Thank you! you brought so many memories about my country. I haven’t been there for 13 years. Doe is made. Can’t wait to give it a try. I love your presentation. Let me try this again. Dough is chilling! Thanks for this recipe!! I went to Argentina about 12 years ago and have tried to find a good one for the shell. This seems like it will work great. I want to return with my husband to show him the beautiful places I saw. However, I think I will take a bottle of A-1 and Texas Pete Hot Sauce on my return trip. I lived in Argentina for 18 months 20 years ago. I haven’t had an empanada since. I was recently asked to make something Argentine to bring to an event, so thought I would hunt down a recipe. Yours looked the most authentic. I would agree that they are much better than the Chilean ones (lived there the year before for 4 months). Just made these to try them out in advance and took them to my husband’s office for a taste-test. They were gobbled up in about 2 minutes flat. They have me longing for more yummy Argentine food. I don’t suppose you have tried your hand at humitas (the sweet ones – again, MUCH different than Chilean ones)? Those were my favorite. Hands down. YUMMY! I’m Cuban our empanadas are made with a sweet dough are smaller and fried- make these with guava. The recipe I love and use most frequently is the one from Saveur ! my ex who is from BA loves them. I don’t always make the dough but when I do I use lard- you can buy very clean from Whole Foods- BIG difference. Otherwise I buy the tapas small ones, made for the oven- the best brand is Saltana- the others are poor quality and taste bad! I also make a caramelized onion, fresh grilled corn with a small amount of shredded cheese – your choice-( small amount) which are to die for! Hi.. I want to start off by telling you that your site is fantastic! Im from Mendoza Argentina I also love that you ejoy Argentine foods..
Me being Argentinian I never knew how to make emapanada dough! I know I know, an Argentinian that doesn’t know how to make empanada dough is unheard of lol but I know many many other great Argentine recipe’s. Again, I absolutely love your website and love your cooking! Thank you for sharing your gourmet experience with us. Hey Jen; I’m hoping you’re still out there! So, I’m planning on making many empanadas for a family party. I’m wondering if you’ve had luck freezing them unbaked? 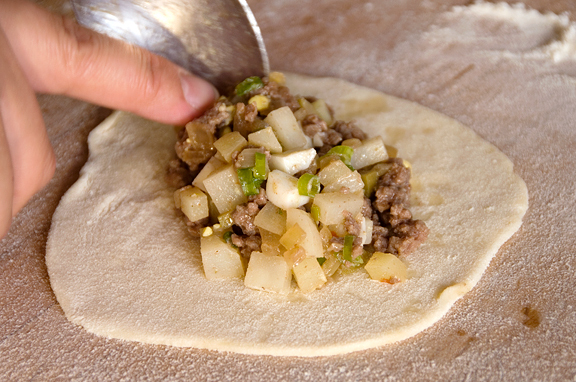 When baked then, do they remain juicy, which, of course, we all know is the most important part of an empanada!!! Any other tips would be helpful! lori – I have not tried freezing empanadas ahead of time. However, The Kitchn says you can freeze them unbaked (don’t let them touch or they’ll stick together) and then bake as usual straight from the freezer, just add a few more minutes to make sure the dough is done (since the filling is cooked). If this is a big production, I suggest you give it a test run on a half or quarter batch to see how it works. Good luck! Hey Jen – I just tried this today. I upped the spices from 0.5 tsp to 1 tsp and added an egg wash before baking. It tasted pretty good and hopefully lays to rest my empanada cravings so I can move on to some other craving/recipe!